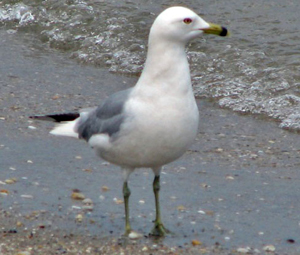 A gull commonly seen in parking lots, the ring-billed gull breeds mostly inland. Although some live along the coast, most of these gulls go their entire lives without stepping foot in the ocean. Voice: Call, a very high pitched and hoarse screeching. Habitat: Salt marshes, coastal bays, beaches, piers, dumps, parking lots, shopping malls, fast food restaurants. Range: The Ring-billed Gull can be found throughout the continental United States. Interesting Facts: Most Ring-billed Gulls come back to breed at the same colony where they were hatched. Once they have bred the first time, they are likely to return to that colony year after year, and also nest within a few meters of their last nesting site.